The Tomato Genomics Consortium fully sequenced the genome of the tomato, Solanum lycopersicu. They report in the Journal Nature that tomatoes possess some 35,000 genes arranged on 12 chromosomes. This research provides insights into fleshy fruit evolution and will allow plant breeders to produce new varieties more quickly with specific desired characteristics. For the first time, the genome of the tomato, Solanum lycopersicum, has been decoded, an important step toward improving yield, nutrition, disease resistance, taste and color of the tomato and other crops. The full genome sequence, as well as the sequence of a wild relative (Solanum pimpinellifolium), is published in the May 31 issue of the journal Nature. Specifically, the genome was sequenced from the “Heinz 1706” tomato. The publication caps years of work by members of the Tomato Genomics Consortium, an international collaboration including Argentina, Belgium, China, France, Germany, India, Israel, Italy, Japan, the Netherlands, South Korea, Spain, United Kingdom and the United States. 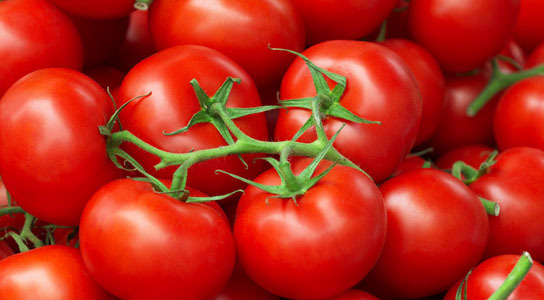 Consortium researchers report that tomatoes possess some 35,000 genes arranged on 12 chromosomes. “For any characteristic of the tomato, whether it’s taste, natural pest resistance or nutritional content, we’ve captured virtually all those genes,” said James Giovannoni, a scientist at the Boyce Thompson Institute for Plant Research (BTI, which located on the Cornell campus) and the U.S. Department of Agriculture (USDA) who leads the U.S. tomato sequencing team, which includes researchers at nine universities, the USDA and Cold Spring Harbor Laboratory, where the wild tomato genome sequence was developed. The sequences of these genes and their arrangement on the chromosomes are described in the Nature article. “The tomato genome sequence provides insights into fleshy fruit evolution,” say the researchers in the article; it also allows plant breeders to produce new varieties more quickly with specific desired characteristics. “Tomato genetics underlies the potential for improved taste every home gardener knows and every supermarket shopper desires, and the genome sequence will help solve this and many other issues in tomato production and quality,” Giovannoni said. Now that the genome sequence of one variety of tomato is known, it will be easier and much less expensive for seed companies and plant breeders to sequence other varieties for research and development, he added. Whereas the first tomato genome sequence cost millions of dollars, subsequent ones might only cost $10,000 or less, by building on these initial findings. At BTI, scientist Lukas Mueller and his team created an interactive website to provide access to the gene sequences of the tomato and related species, and Zhangjun Fei and Joyce Van Eck contributed to the sequence and its analysis work. Strawberries, apples, melons, bananas and many other fleshy fruits share some characteristics with tomatoes, so information about the genes and pathways involved in fruit ripening can potentially be applied to them, Giovannoni said, helping to improve food quality, food security and reduce costs. “Now we can start asking a lot more interesting questions about fruit biology, disease resistance, root development and nutritional qualities,” Giovannoni said. Tomatoes represent a $2 billion market in the United States alone. The USDA estimates that Americans consume, on average, more than 72 pounds of tomato products annually. The sequencing builds on the critical work of Cornell’s Steven Tanksley and BTI’s Greg Martin in the 1990s. Tanksley, Martin and other Ithaca scientists developed genetic maps and other molecular tools for tomatoes to study mechanisms of disease resistance, and those tools ultimately paved the way for the consortium’s sequencing efforts, Giovannoni said. Tomato genome and sequencing research in the United States was supported by the National Science Foundation and the USDA. 1 Comment on "The Tomato Genomics Consortium Sequences the Tomato Genome"
Hopefully they find a way to make them (and other fruit/vegetables) more tasteful like they were before all the tinkering.